LANSING — A year later, Dean Altobelli still remembers the moment he got the phone call. He remembers where he was, what he was doing and the first thought that crossed his mind when he heard the news. The call came from Altobelli’s attorney. The news was that Altobelli, who had been a lawyer himself for nearly two decades, had lost the latest battle in a four-year legal fight against the leaders of one of the state’s largest law firms. The Michigan Supreme Court reversed rulings from lower courts, taking a drastically different stance and siding with the law firm, in which Altobelli once had ownership interest. “Politics prevailed over the rule of law,” Altobelli said of his first thought upon hearing the court’s decision. It’s a belief Altobelli, 52, of Escanaba, still holds a year later, he says, and it’s part of what’s driving him now to try to change Michigan law. The lengthy legal dispute between the powerful law firm Miller Canfield and Altobelli, a former Republican candidate for Congress, is stirring new discussion in Lansing over the role of political contributions in the state’s judicial system, which has seen some of the most expensive races in the country. As the Michigan Supreme Court decided Altobell’s case in the summer of 2016, two of its seven members were running for re- election. 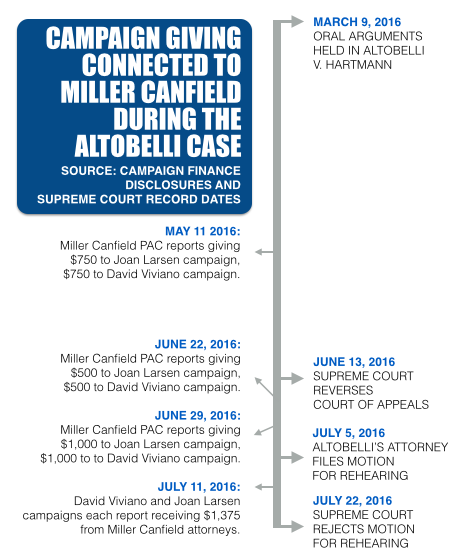 In the weeks before and after giving the final order in Altobelli’s case, the two justices’ campaigns each reported receiving more than $3,000 from either Miller Canfield’s political action committee (PAC) or high-ranking attorneys in the firm. “It’s hard to be independent and impartial when during the pendency of the case, you’re taking money from parties of the case,” Altobelli said in an interview. Altobelli has experience in judicial fundraising. As a Miller Canfield principal, he remembers going to fundraisers where attendees would make sure their names tags were visible before shaking judges’ hands. But a spokesperson for the Michigan Supreme Court, John Nevin, cautioned that in Michigan, it’s not the judges who solicit or receive contributions. It’s their campaign committees. Law firms frequently give to judicial candidates, the donations are disclosed, and if someone sees bias, that person can file a motion to recuse the judge in question, Nevin said. In Michigan, there’s no law barring judicial campaigns from taking contributions from lawyers, law firms or others who could be involved in cases. Altobelli is working to change that. And a second-term Republican state senator has agreed to craft the bill, which will likely be introduced later this year. Sen. Tom Casperson, a Republican from Escanaba, has known Altobelli and his family for a “long time,” Casperson said. “Dean is not the kind of guy who runs around crying wolf, complaining about stuff,” Casperson said. Casperson said while there’s no evidence of wrongdoing, Altobelli’s situation simply doesn’t look good. 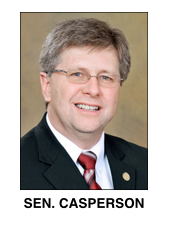 The details are still in flux, but Casperson’s future bill will limit judicial campaigns’ ability to take contributions from parties with cases pending before them and will limit the parties’ ability to give contributions to the judges, he said. It’s unclear whether Casperson’s upcoming proposal would withstand a legal challenge on the constitutionality of lawmakers attempting to regulate judges’ activities. The Michigan Supreme Court has previously resisted attempts by the Legislature to regulate judicial conduct. 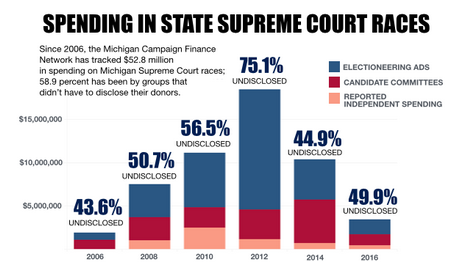 In Michigan, campaigns for the state Supreme Court regularly cost millions of dollars with about half of the money coming from undisclosed sources giving to groups working independently of the candidates’ campaigns. The undisclosed money could come from groups or individuals with cases before the courts as well, but the public has no way to determine that. There’s long been concern that groups interested in pending cases or upcoming cases in Michigan could financially support the campaigns of judges who would decide the cases. 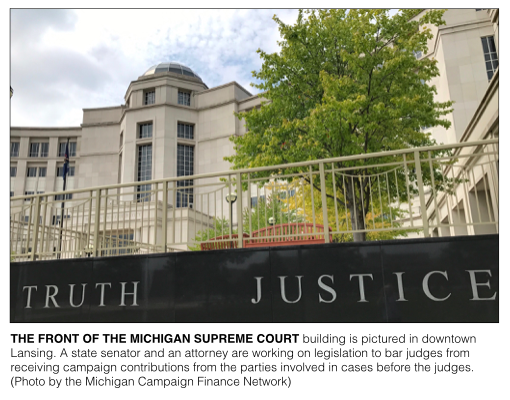 In 2012, a judicial selection task force, chaired by two former Michigan judges, called for the disclosure of the funding sources for Supreme Court campaign advertisements. Anonymous spending “obscures financial contributions that might cause apparent conflicts of interest and require justices’ recusal from cases involving those donors,” the task force’s report said. Michigan’s most expensive Supreme Court races came the same year as the task force report. In 2012, three seats were up for election, and the races cost more than $18 million. In 2016, the two incumbent justices’ campaigns each raised more than $500,000, so the Miller Canfield contributions in question were just a fraction of their overall fundraising hauls. While the bill hasn’t been introduced yet, Casperson said he’s already heard pushback on his proposal. Critics have questioned why his proposal would be good for the court but not good for lawmakers who can take campaign contributions from lobbyists seeking to influence their decisions. Altobelli’s past as a football player for Michigan State University connects to his legal dispute with Miller Canfield. He played for the Spartans for four years. He was an Academic All-American. He studied mechanical engineering, graduating with a 3.96 GPA. He went on to earn a law degree from Yale Law School in 1993. That same year, he began working for Miller Canfield. 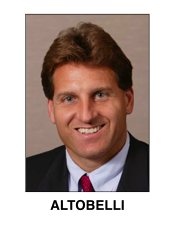 In 1996, Altobelli, of Escanaba, ran for Congress in the 1st District as a Republican. But Altobelli lost in the primary. He worked for Miller Canfield until 2010. He was a senior principal at the firm and became an equity owner in 2006. His separation from Miller Canfield inspired the legal battle that ended up before the Michigan Supreme Court in 2016. The two sides of the case disagree on many of the facts that led to Altobelli’s lawsuit. However, in 2010, Altobelli received an offer to spend time with the University of Alabama’s football program. Alabama’s coach was Nick Saban, who coached at Michigan State when Altobelli played there. According to court records, Altobelli proposed a leave of absence from Miller Canfield to three officials in the firm. Altobelli has alleged Michael Hartmann, CEO of Miller Canfield, initially supported his proposal. Hartmann denies that, according to court documents. Miller Canfield declined to comment on this story. While the specific details are disputed, as Altobelli planned to pursue the opportunity with Alabama (he’s now an “analyst” with the program), a dispute arose over Altobelli’s continued ownership interest in Miller Canfield. “No principal of the firm has ever been given approval to work full time at another job while remaining a principal at Miller Canfield,” Hartmann said according to court documents. Altobelli refused to resign and demanded a vote of the full ownership on any effort to terminate his ownership. The vote didn’t take place, and his ownership rights were terminated. Altobelli filed a suit against seven top firm officials, alleging that they “usurped power vested in the firm’s owners” by terminating his ownership interest without a vote of the full ownership, about 100 people. Altobelli sought to hold the individuals personally liable. One of the key legal questions became whether Altobelli could battle the individual Miller Canfield officials in court or whether the matter should go to arbitration, a way to resolve disputes outside the court. Arbitration is considered a more business-friendly option, and it can lead to smaller awards for plaintiffs. Altobelli had signed an operating agreement that stated disputes “between the firm . . . and any current or former principal or principals of the firm” would go to arbitration. But Altobelli has argued that his dispute with the individuals isn’t with the firm itself but with the seven individuals he sued and isn’t subject to that piece of the agreement. The defendants have argued that they were acting in their capacities at the firm and that Altobelli’s dispute with them is really with the firm so the matter should be subject to the arbitration clause. An Ingham County Circuit Court judge agreed with Altobelli, writing in an opinion that the arbitration clause “unambiguously limits the reach of the arbitration clause” to disputes between the firm — not individual firm employees — and any current or former principals. The case then went to the Court of Appeals, which agreed with the Circuit Court on that subject in similarly strong language. The Court of Appeals decision was unanimous, 3-0. “The operating agreement explicitly endows them with complete power and responsibility for managing the affairs of the firm,” Bernstein wrote. Altobelli contends that the individuals didn’t have complete authority. Their authority is limited by the operating the agreement, his side has said. The Michigan Supreme Court ordered the dispute to arbitration, siding with the Miller Canfield officials. The Supreme Court’s decision came down on June 13, 2016. Altobelli filed a motion for rehearing, which was denied on July 22. The candidate committees of Justice Joan Larsen and Justice David Viviano each reported receiving eight contributions from Miller Canfield’s PAC or attorneys with the firm between May 11 and July 26. The contributions in that period totaled $3,900 for each of the two justices’ campaigns. The campaigns of Larsen and Viviano, which at times fundraised together, each raised $5,250 from Miller Canfield’s PAC and other attorneys with the firm for the entirety of the 2016 election cycle. Over the last 10 years, Miller Canfield’s PAC or its lawyers have given campaign money to six of the seven justices on the state’s high court. The only one who hasn’t reported receiving money from Miller Canfield is Bernstein, the justice who wrote the opinion in the case. On May 31, 2017, Altobelli penned a letter to Gov. Rick Snyder, requesting legislative action. “The Legislature and the Governor should take legislative action to prevent judges from taking political money from parties or PACs affiliated with parties during a case because some justices on the Michigan Supreme Court apparently do not currently believe they are prohibited from doing so,” Altobelli wrote in the letter. Michigan’s Code of Judicial Conduct says judges should uphold the integrity and independence of the judiciary. It also says they should avoid the appearance of impropriety. Because judges’ committees do the fundraising, Nevin said in his experience, judges aren’t even aware of who has contributed, let alone how much. “If anyone believes that those large political donations that are given are anything but an investment, then they’re kidding themselves,” he said. Casperson said while a judicial candidate may not be able to filter out all of those with cases pending who are attending fundraisers, the individual donors themselves would definitely know that they were giving to a judge considering their case. That’s why Casperson’s upcoming bill will take on both the giving and the receiving of contributions. Casperson said he doesn’t want to attack anyone, but he said the matter is something the judges themselves should be concerned about. “For me, I would argue that if you look at the merits of this, what happened here, if we just say nothing about it, I think that’s equally as bad,” the senator said.